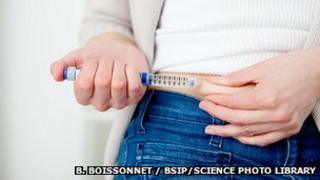 A drug that was used to treat a skin disorder has shown signs of being able to treat aspects of type 1 diabetes. A small trial on US patients suggests that alefacept helps the body produce its own insulin, which is key for people with type 1 diabetes. Type 1 diabetes affects around 400,000 people in the UK. Researchers said the drug could be better than other treatments because it protects the immune system - but more research was needed. The findings are published in The Lancet Diabetes & Endocrinology. Alefacept (sold as Amevive) was used to treat the skin disorder psoriasis in the US before it was withdrawn by its manufacturer in 2011. The drug was never approved for the European drug market. Psoriasis, like type 1 diabetes, is an autoimmune disorder that occurs when the immune system attacks healthy skin cells. In clinical trials of the drug on psoriasis, the drug was found to attack specific types of T-cells that were also involved in attacking insulin-producing cells in type 1 diabetes. So researchers, led by a team at Indiana University, Indianapolis, decided to investigate if it could have any effect on newly diagnosed type 1 patients. In the trial, which is continuing, 33 patients received weekly injections of alefacept for 12 weeks, followed by a break of 12 weeks, and then another 12 weekly doses. Another 16 participants were given placebo injections following the same schedule. The researchers found no difference in how well the pancreas produced insulin two hours after eating food, but they did find "significant differences" between the two groups four hours after eating. At this point, the group who received the drug showed they were able to preserve insulin while the placebo group's insulin levels decreased. Type 1 diabetes is an autoimmune condition, where the immune system attacks the cells of the pancreas that produce insulin. This results in insulin deficiency and the body being unable to regulate blood sugar. Scientists suspect the condition often follows a trigger such as a viral infection. After 12 months, the same group showed no significant increase in insulin use, yet those in the placebo group did. The first group also had fewer episodes of hypoglycaemia, low blood glucose levels. which are common in people with type 1 diabetes. Lead researcher Prof Mark Rigby, of Indiana University, said the first 12 months of the trial were encouraging. "Although the primary endpoint was not met, several key secondary endpoints were significantly different between treatment groups, suggesting that alefacept might preserve pancreas cell function during the first 12 months after diagnosis." He said the initial findings meant that in the future the drug "could be used to stabilise type 1 diabetes and prevent its progression" - but it was unlikely to be a cure. He added that the trial would continue and further measurements would be taken after 18 months and 24 months. Writing about the study in The Lancet, Dr Kevan Herold, of Yale University, said: "It is important to underscore these small successes since, as in other fields such as oncology and infectious diseases, the small achievements acquire greater significance when they are combined." Karen Addington, chief executive of JDRF, the type 1 diabetes charity that helped fund the study, said the outcome was promising. "The results of this study appear worthy of further exploration. Small steps forward such as this take us closer to a world without type 1 diabetes. "It is a challenging and complex condition. But type 1 diabetes will one day be cured. It's a matter of time, money and excellent research." What is the future for diabetes treatment?